The unveiling of Apple’s iPad last month may have finally ushered in the age of the e-reader. For years companies have been experimenting with electronic reading devices that serve as miniature libraries and magazine stands, but the general public has been slow to sign on. With the advent of the iPad, which also serves as a mini-laptop and film studio, the day may soon be here when e-readers are as ubiquitous as iPods. Questions remain, however, about the content served up on electronic readers and who should profit from it. Amazon.com has been battling with book publishers over prices for digital books sold on the company’s Kindle reading device. Newspapers have also complained about Amazon’s demand for a 70 percent cut of Kindle content. Apple seems willing to give publishers a larger share of revenue, but whether they can survive on a reduced revenue stream is an open question. Of particular concern is the fate of small publishers and especially of journals. Amazon has been eager to market magazines like Newsweek and The New Yorker on the Kindle, but good luck finding The American Scholar or National Review. Devotees of electronic reading devices extol their portability and affordability. Who can argue against books for $10? 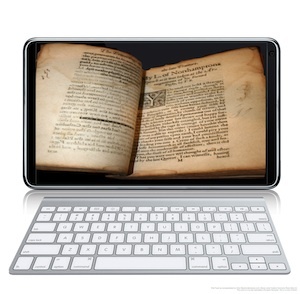 We may be entering the golden age of e-readers, when technology is ample and content cheap. These days, however, will be short-lived. There will be a time, sooner than we expect, when nearly everyone will own an e-reader. But what will they be reading? As Haiti struggles to make effective use of billions in aid, Transparency International has just published a handbook to help agencies there and elsewhere combat the kinds of corruption that could prevent assistance from reaching the neediest. Roslyn Hees, a co-author of the handbook, Preventing Corruption in Humanitarian Operations, has said that post-earthquake Haiti presently represents “a perfect storm for high corruption risk: You have a seriously damaged institutional infrastructure, a country with endemic corruption...and sudden influxes of huge amounts of resources.” In 2009, Haiti ranked 168th on T.I.’s annual Corruption Perceptions Index. The idea for the handbook arose from experiences after the 2004 Indian Ocean tsunami. Large sums raised for stricken countries there did not always reach those most affected. The book provides agencies with a practical, hands-on tool describing good practices that could be useful for agency staffs in preventing corruption in their operations. T.I. acknowledges that anti-corruption practices cannot be the first priority after disasters. But once the initial steps to cope with the devastation are past, then, in the reconstruction phase, prudent practices should be brought into play. The handbook notes that corruption is not limited to financial mismanagement, but may also include nepotism and sexual exploitation. As Haiti’s recovery gets under way, the handbook should be a useful resource not only in that country, but in other parts of the world, too, when natural disaster strikes again. Readers of Sigrid Undset’s Kristin Lavransdatter, a trilogy of novels set within the very Catholic culture of 14th-century Norway, will especially appreciate what is something of a historical U-turn. Ten years ago the Cistercians, a Catholic contemplative order based on the Rule of St. Benedict, began to re-establish a Catholic presence in Norway not seen since the Reformation. It started with a group of Trappistine nuns, mostly from the Mississippi Abbey in the United States, who envisioned a new community on the island of Tautra in the Trondheim Fjord. Centuries earlier, in 1207, a Cistercian community was founded there that ultimately grew to include 30 monks responsible for 170 small farms. The sisters bought land near the ruins of the old monastery, moved to the site and built a new cloister, workplace, guesthouse and chapel: Tautra Mariakloster. Now the sisters have been joined in Norway by four monks from the French Abbey of Cîteaux, who dedicated their own new monastery, Munkeby Mariakloster, last September. Their mission is to offer to those who come seeking it “a quiet presence with the spiritual riches of liturgy, meditation, and lectio divina.” The monks are rebuilding a monastery established in 1180. In addition to Cistercians, Dominicans and Poor Clares have also returned to Norway. Contemplative Benedictines live in Denmark and Sweden; Brigittines and Carmelites in Iceland. This article also appeared in print, under the headline "Current Comment," in the March 1, 2010 issue.